Chakra is a Sanskrit word meaning, “Wheel or Circle of Light”, and refers to one of the 7 major energy centers, which spin like wheels through and around the body. Each one of these energy centers has a specific purpose in the healthy functioning of our bodies. Each chakra varies in colour, size or shape, rotation or spin, and the amount of energy that is produced by the chakra. These characteristics all affect the auric field. The chakra is “blocked” when the energy flow is restricted – thereby causing dis-ease. Five of the major chakras are in alignment with the spine, while the sixth is located between the eyebrows, and the seventh, just above the crown of the head. The size of the chakra is dependent on the individual’s personal development. The colours of the 7 major chakras affect different parts of the body. Location for healing – The base of the spine. Areas of Influence – The root chakra relates to material comfort and awareness of reality. It is the source of kundalini (or serpent energy) that provides the driving power for the chakra system. Imbalances – pain or tension, constipation, lack of energy, flight or fight mechanism in overdrive and fear. Use a red stone to balance this chakra. Location for healing – The centre of the sacrum/lower abdomen, around the reproductive system. Areas of Influence – All bodily fluids, hormones, the reproductive system. Sensuality, desires and cravings. Imbalances – fluid retention, menstrual problems, frigidity. Emotional problems with food, alcohol, cigarettes or compulsive behaviour. Use a orange stone to balance this chakra. Location for healing – Above the naval, around the stomach area. Areas of Influence – Digestion, the liver, small intestine and stomach, the metabolism. 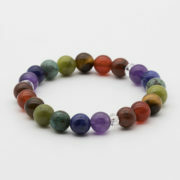 This chakra affects world power, independence and the ability to learn from experience. Imbalances – digestive disorders, sluggish metabolism, inflexible attitutudes, hyperactivity and lack of self confidence. Use a yellow stone to balance this chakra. Location for healing – The centre of the chest level with the heart. Areas of Influence – Heart, lungs. The development of compassion and spiritual love. The awareness of past lives and ancient worlds. Imbalances – constant coughs and colds. Allergies, heart palpitations. Psychosomatic illnesses and over sensitivity to the problems of others. Use a green stone to balance this chakra. Location for healing – Close to the adams apple in the centre of the neck. Areas of Influence – Throat and speech organs, mouth, the neck, shoulders & the ears. The ability to communicate & creative powers. Imbalances – sore throats, mouth and ear problems. Inability to express feelings or translate thoughts and ideas into workable plans. Use a blue stone to balance this chakra. Location for healing – The centre of the brow. Areas of Influence – Eyes and ears, sinuses, the left and right hemispheres of the brain. Communication with angels and devas, spiritual healing abilities, prophetic powers. The brow chakra connects us to our guides and own higher knowledge. Imbalances – unexplained blurred vision, headaches, migranes, blocked sinuses, nightmares and insomnia. Use a indigo stone to balance this chakra. Location for healing – The top of the head. Areas of Influence – The brain and the whole body. The soul/psyche. Imbalances – headaches and migranes. Inefficient functioning of the immune system. Forgetfulness and frequent minor accidents,. A lack of meaning in life. Crystals that are the same colour as a chakra will enhance its natural qualities. For a simple balancing chakra healing place one stone of the appropriate colour on each chakra for a few minutes. Use small tumble stones or crystal points. Located at the base of the spine use a RED stone between your legs to balance physical energy, motivation and practicality and to promote a sense of reality. Located in the lower abdomen below the navel, use an ORANGE stone here to balance creativity example: Carnelian to release stress and blocks in your life that prevent enjoyment. Close to the bottom of the rib cage. Use a YELLOW or GOLD stone in this position to clear your thoughts, reduce anxiety and improve confidence. This is in the centre of the chest, use a GREEN stone here to balance your relationship with others in the world, to increase calm and create a sense of direction. At the throat use a LIGHT BLUE stone here to ease communication difficulties, express yourself and bring peacefulness. Located in the centre of the forehead use a DARK BLUE or INDIGO stone here, to increase understanding, access ideas and promote intuitive skill and memory. Situated a little way above the top of the head. A VIOLET stone placed in this position intigrates and balances all aspects of self. Physical, Mental, Emotional and Spiritual.